We would like to introduce to you our new MTK Kit. The MTK Series was designed to install Honda’s newer K Series engine into the Classic Mini (1959-2000), upgrading the Classic Minis A-Series engine with today’s most trusted engines built by Honda. With nearly six times the horsepower of a stock Mini 850, you might understand one good reason for the swap. Reliability and knowing that your car will crank and run in any condition is another great reason. Have fun with your Classic Mini. 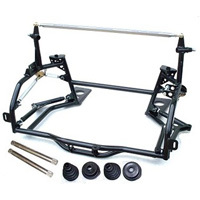 Mini Mania has taken all of the headaches out of this engine swap by developing the MTK subframe. 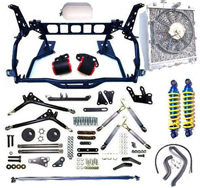 This Package includes: MTK Kit, K Coil-Over Shock Kit, K Aluminum Radiator Kit, and a Poly Mount Kit.